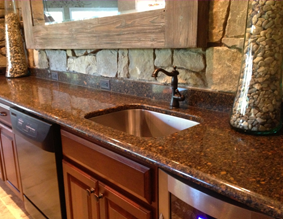 Update your kitchen or bath with custom designs, responsive service, & stunning craftsmanship. Dexter Cabinet & Countertop is a family owned and operated business that has been serving Washtenaw County since 1984. We specialize in providing high quality kitchen products with full-service installation at competitive prices. We pride ourselves on helping our customers with every aspect of their cabinet and countertop project and provide unbeatable turnaround times with minimal disruption to your home. When combined with our professional installation and attention to detail, it's easy to see why we are Ann Arbor's preferred supplier of cabinets and countertops. We offer some of the biggest names in the cabinet and countertop industry. Names like Merillat, Corian, Cambria, and Wilsonart. By utilizing our 20/20 design software, showroom selection center, and 12 x 12 countertop samples, it's easy to visualize your ideas. Please contact us today to request a free estimate where we will discuss your vision and goals, create a design, and provide an accurate estimate. Why Choose Dexter Cabinet and Countertop?